What better way to spend December than keeping warm with the comfort of animal companions? This month’s querent, who will be referred to as Arthur, writes in asking a question about his feline companion Tiger. Arthur states that since given the opportunity to work from home, he is often visited by his cat Tiger who appears to gaze directly into his eyes as if he were longing to communicate, but Arthur is not sure what Tiger is trying to tell him. He feels this is more than the typical “feed me, pet me, clean my box” communication as his cat seems to be deep in thought when he does this. This months’ reading is on behalf of Tiger and Arthur, to help unlock the doors to communication. While conducting this reading I didn’t focus so much on Arthur, the human in the relationship, but rather shuffled the cards focusing on the energy of Tiger as it seems he has something important to say. While focusing on Tiger’s energy several impressions emerged. There is a strong sense of approval seeking, Tiger is looking to Arthur to acknowledge his behavior and how well he does his “job” which is very important to him. Tiger is protecting the home and family and wants Arthur to see that although sometimes he gets a little carried away with his playful antics he is, overall, very serious about his work. He also sees Arthur as the CEO to whom he reports and receives his “instructions” for what he needs to do. His role is to look out for the people and animals in the home and to be on alert for trouble. There was also a strong impression of pride and desire for others to be proud of him as well. 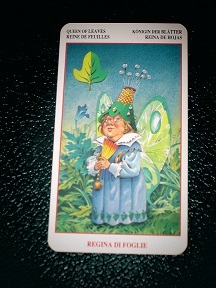 Tiger’s reading brings three cards, The World, numbered 21, the Queen of Leaves, and the 6 of Bells which appeared reversed. Arthur’s assumption that Tiger’s communication was of importance is validated here as a Major Arcana card is part of this reading. This affirms that Tiger is trying to share something more than daily cat chat. First and foremost, Tiger is maturing. He is reaching a stage of his life in which he has accomplished many achievements and is likely to be getting along in years or at least reaching seniority and this is important to him. It is important in one sense because he wants his seniority to count for something among his humans. One way that human concepts like social democracy confuse our furry companions lies in our cultural values around equality and sharing. Tiger has no problem sharing and sees himself as generous, but it is in his nature as a cat to take hierarchy more seriously than his human buddies may realize. Therefore it is important for his seniority to be respected- certain treats or privileges given too freely among other cats in the household challenge this order that he feels he has established. He therefore asks to keep in mind the social dynamics among cats in the household and his need for certain territories or routines that were his first to be respected as such. He does not seem greedy, but rather seems to want acknowledgement of his unique position as senior cat. Whether by setting aside certain treats as his, or given to him first then to the others, or allowing that not all toys and territories are equal, would show him recognition of his role as in charge of the cats. The other significant aspect of the World card for Tiger reflects his personal maturity. He seems proud of an accomplishment and wants to make sure it is known that he is doing his best. 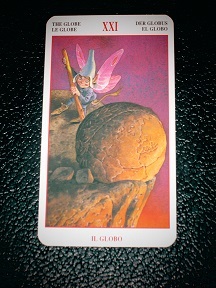 This accomplishment may involve four stages or have four aspects or may be in relation to four other people or animals- but it seems that he is achieving a higher degree of balance and harmony and that this has been a real accomplishment for him. In human culture, it would be the equivalent of either a graduation or retirement. He has accomplished a milestone of development and wants it known that he is doing his best to not regress. It is also no surprise that Arthur perceives something unique in Tiger’s insistence on eye contact. The Queen of Leaves is the diplomatic spokeswoman conveying her ideas and thoughts eloquently and directly. Her appearance in the reading shows that Tiger is in fact trying to be mindful of how he communicates. He has toned down his approach but is asking for undivided attention. He is conveying that he does not require excessive coddling but does want lines of communication to be open- eye contact is a big part of this- he also may lean more toward telepathic communication than other animals in the home who may be more demonstrative with their messages. He is definitely a thinking cat and is curious and in need of mental stimulation. He wants to be kept informed even if plans or routines do not involve him. He sees himself as a manager in the household, not the top manager but second in command and it is important to relay information to him. He appreciates that Arthur talks freely to him but also wants Arthur to know that he is in a sense “talking” back- especially when he insists on eye contact. He also seems to want a bit more cognitive stimulation- hunting games or activities that allow him to safely express his inquisitive nature would be appreciated. Finally, the 6 of Bells, reversed suggests that part of the communication is open ended and represents an issue not yet resolved. Tiger seems to be concerned about a need for balance when it comes to territory or tangible items of importance to him. These may be toys, treats or items that would be considered like money in cat world. He feels as though something was taken from him- perhaps territory that he is used to- he feels a loss of balance in the hierarchy regarding his possessions or food and is waiting for Arthur to “repay” him. He feels Arthur can rebalance this discrepancy and he gives this a focus much like people would give in matters of justice or conflict resolution. It seems Tiger is looking to Arthur to rebalance the scales in his favor and in some manner express to other members of the household that certain territories, food, or treats are for Tiger reserved for Tiger. 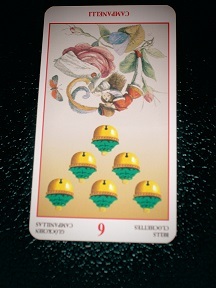 Best of luck Arthur, and Tiger, thank you for the privilege of allowing readers a Tarot fueled glimpse into your world. Remember, whether you walk on two legs or four, all readings are intended for entertainment purposes only in accordance with NYS law. Interested in being the Querent in next month’s column? Ask your human to contact Angela at Trionfi78@gmail.com.